My bestest bud had planned a surprise party for her hubby’s milestone birthday, over in Lincolnshire where they live, and His Nibs and I were invited. I do like a party, and couldn’t wait to see the birthday boy’s face when he saw us all waiting for him in The Greek Taverna in Sleaford! 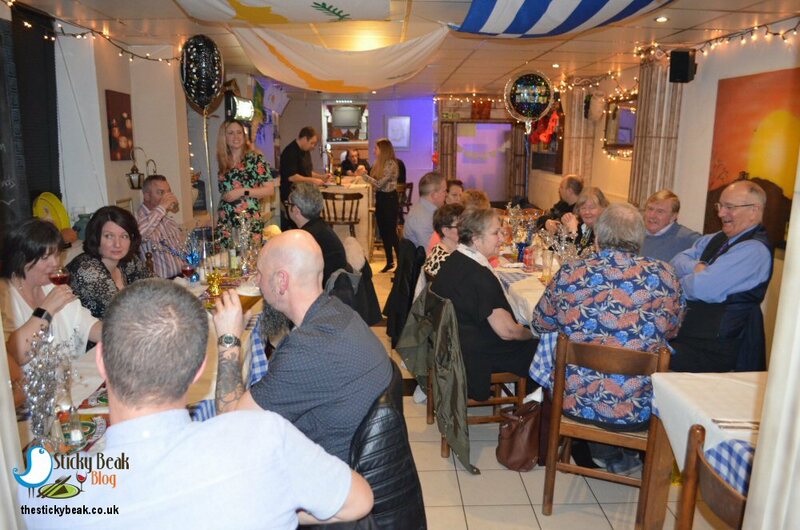 Located in the top corner of the town’s market place, The Greek Taverna aims to provide its diners with an authentic experience of homemade Greek Cypriot dishes that are all freshly made on the premises. The decor is typical of Greece and its Islands; blues and whites are the dominant colour scheme, with faux vines scattered around, earthen-ware pottery, and the flags of Greece and Cyprus providing pops of colour. Due to it being a large party –we took over the entire restaurant! – the owners asked if the guests could pre-order their starters and mains, to make things easier as their kitchen is fairly compact. It’s thirsty work keeping secrets, so whilst we all waited for the guest of honour we ordered drinks from the bar. For a small establishment, they have a blooming sturdy selection of drinks for you to choose from – including Ouzo, which got drunk later in the evening! With birthday boy comfortably settled with drink in hand to get him over the shock at seeing friends from the length and breadth of the country, it was time to start serving the starters. There was a large variety of starters within the group, including Whitebait, Calamari, Keftedes (meatballs), Tiropitakia (Feta filled pastry parcels), Bastourma (spicy Greek beef sausage), and Dolmades (stuffed vine leaves). His Nibs had chosen the Bastourma to begin his meal, and it really did have a kick to it. The sausage itself had been sliced to make it more attractive presentation-wise, and its deep red colour really shone against the serving platter. His Nibs was impressed with the firm, dense texture of the sausage, as well as its intense taste. The Bastourma had been grilled to give it extra visual appeal, and it came with a colourful side salad which provided some crunch in the mouth. I decided to have a fairly light starter, in light of having chosen a hearty main course, so Dolmades was my choice of first course. This classic Greek dish comes in both vegetarian and meat-containing forms and the one I had comprised of the vine leaves being stuffed with minced Pork, Rice, and Herbs. A lot of folk shy away from Dolmades thinking that the leaves will be tough or woody, but in reality they are neither of those things. The leaves are fairly soft and I had no problem at all cutting into them, a soft wisp of steam escaping from them as I did so. 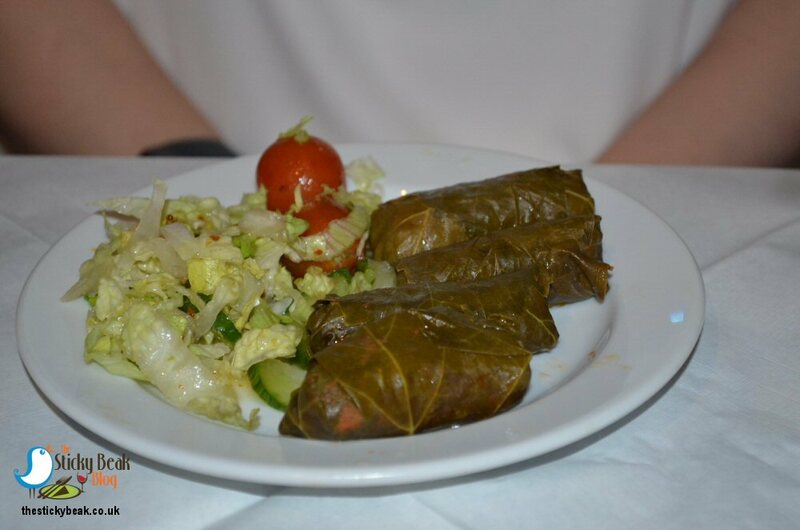 Dolmades can also be served cold, but it was nice to have them warmed through on a winter evening. The meat and rice stuffing was nicely herbed and seasoned, making it light on the palate, which was exactly what I wanted. The team of four, managed to get all the guests served fairly promptly – no mean feat given that folks had forgotten what they’d ordered, so my buddy’s notes had to keep being referred to! A quiet hum of conversation could be heard between mouthfuls of food as guests mingled nicely with each other; some had never met before, but you wouldn’t know. The plates were cleared away quietly and efficiently when everyone had finished their starters. As we waited for mains to be brought out, the guests swapped seats and talked to the birthday boy, and also to other people in the party that they did know. The atmosphere was exactly as you’d find at a meal in Greece; relaxed, happy, and informal. Drinks were drunk at a leisurely pace and glasses refreshed as necessary by the lovely chap in charge of the bar. After a short wait, the main courses were being brought out, along with large bowls of salad, rice, and warm Pitta breads for guests to help themselves to. I really do like this casual way of dining, it seems so much more conducive to happy times and conversation. As with the first course, mains were a wide mix of dishes: Rib Eye Steak, Souvlaki (choice of Chargrilled Chicken or Pork), Mousakka, Stifado, and the pre-orderable (24 hours notice required) Arnaki Kleftiko. Service was a little slower with the mains, but I suppose this was down to the fact that hot dishes need to removed from ovens carefully, so things can’t be rushed. Even so, it wasn’t an unduly long time until the last person got their meal, although I’m sure it must’ve felt an absolute age! With their meals in front of them, the guests helped themselves to fresh salad, warm spiced rice, and slices of warm Pitta bread. The Greek Taverna certainly don’t skimp on the accompaniments and there was plenty to go around of everything. There was no reaching either; the sides had been positioned between each quartet of diners, making it easy for folks to help themselves as required. 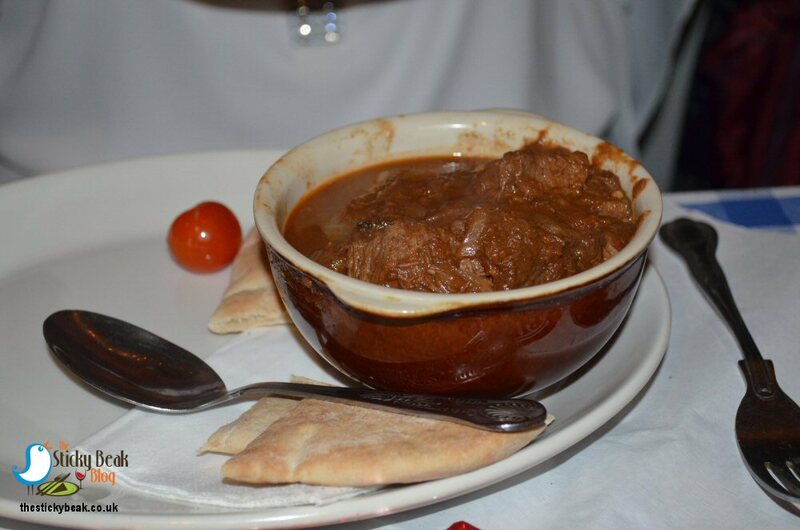 I had ordered the Stifado; slow cooked chunks of Beef with Shallots and Red wine, and it came in a lovely earthen bowl. The smell was incredible - warm and rich, and it was making my mouth water before I even took the first mouthful! Lovely big chunks of Beef had been cooked to make them wonderfully tender, and their full flavour came bursting through on my palate. The shallots were soft and sweet, and had taken on some of the red wine flavour due to the lengthy cooking process the Stifado had undergone. I used the Pitta bread to scoop up the last remaining sauce, eager not to let any of it go to waste. 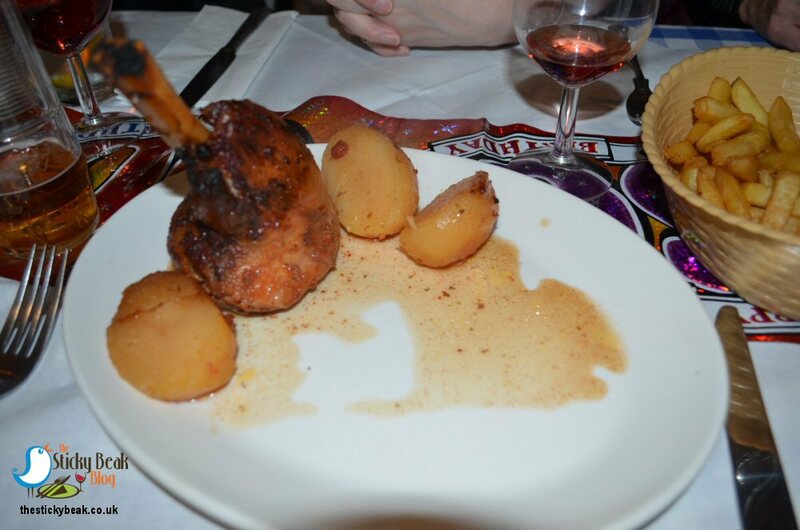 The Man Bird had pre-ordered the Arnaki Kleftiko, a slow cooked Lamb and Potato dish with herbs. When it came out we both gave a little gasp of joy; the Lamb was a shank that was on the bone and its aroma was simply magnificent. The meat had an incredibly rich flavour to it and a gorgeous texture that melted on the tongue – the Lamb had needed the merest of pressure from the knife, it fell away when cut. During the cooking process the Lamb’s juices had run out and seeped into the potatoes in the dish, giving them a wonderful extra flavour. 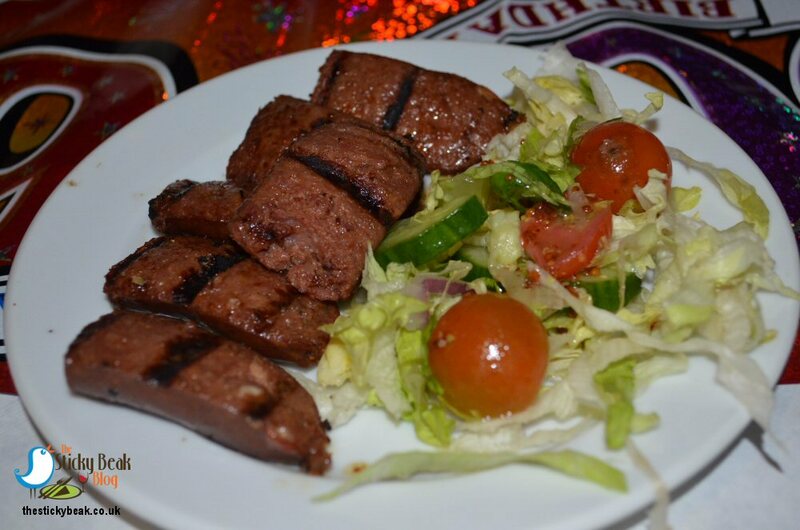 Some of the other dishes, such as the Souvlaki, were very simply presented – literally being comprised of the chunks of meat nestled in opened Pitta bread. This did cause a couple of eyebrows to be raised; I think folk were expecting something flashier. Clearly they haven’t dined a la Grece before! Despite their simple appearance, the Souvlaki’s were delicious and the meats rich taste was abundant in the mouth. You can’t go to eat at a Greek restaurant and not indulge in a spot of plate smashing, and we watched the guest of honour sling one after the other to the floor with gusto! It didn’t take long for others to join in, and there was much laughter to be heard ringing around the room. As we all left, we thanked the owners for hosting such a fantastic evening it had certainly been a night to remember, not only for the occasion we were celebrating, but also for the food. Hot Wings deserved here, most definitely.